Advancements in technology have raised the level of threats in the cyber age. These threats touch both the business world and our personal lives. Information technology is no longer a “back-office” function. Once considered a process area that was solely part of the Chief Information Officer’s domain, companies must now acknowledge that whether the threats are internal or external, they are very real and can and will cause harm to many organizations in many ways. There are many aspects to understanding the cyber world and those aspects continue to change as the business world evolves. As a result, it is imperative that professionals understand and be prepared to deal with the multitude of ever-growing cyber threats. 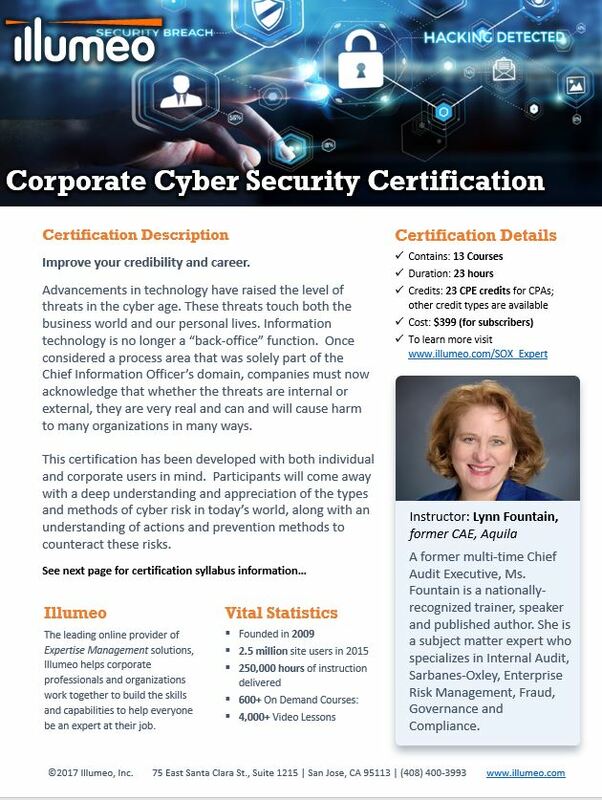 This certification has been developed with both individual and corporate users in mind. Participants will come away with a deep understanding and appreciation of the types and methods of cybersecurity risk in today’s world, along with an understanding of actions and prevention methods to counteract these risks. Lynn Fountain is widely considered an expert in the field of Sarbanes-Oxley and has led initiatives in compliance efforts. In addition, her expertise in the field has been recognized through her ability to provide individualized training on the legislation and compliance requirements as well as assist organizations in establishing the proper control framework for compliance. Course participants have been quoted as saying: “Ms. Fountain should instruct a PhD in Sarbanes-Oxley Compliance.” Ms. Fountain’s ability to break-down the various aspects of the legislation and communicate its importance in relevant terms is the key to the success of her courses. This course examines the landscape of cyber threats as they currently exist. This course focuses on components and roles for a cyber security program. This course evaluates several attributes critical to the proper establishment of a cyber risk management program. This course takes a deep dive into the “identify” function of the NIST cyber security framework. This course discusses evaluating various methods to assign priorities to identified cyber assets. In this session we begin to delve into the detection phase of a cyber risk assessment. This segment delves deeply into concepts that must be well understood and planned in order to ensure the respond function is effective. This session explores elements which will assist the organization in planning for an effective cyber breach recovery. This course delves into the process of assessing risk management status utilizing the tier concept. This course focuses specifically on personal identify theft and processes individuals can use to protect their information. This course focuses specifically on Business Identify Theft and processes companies can use to protect their information.